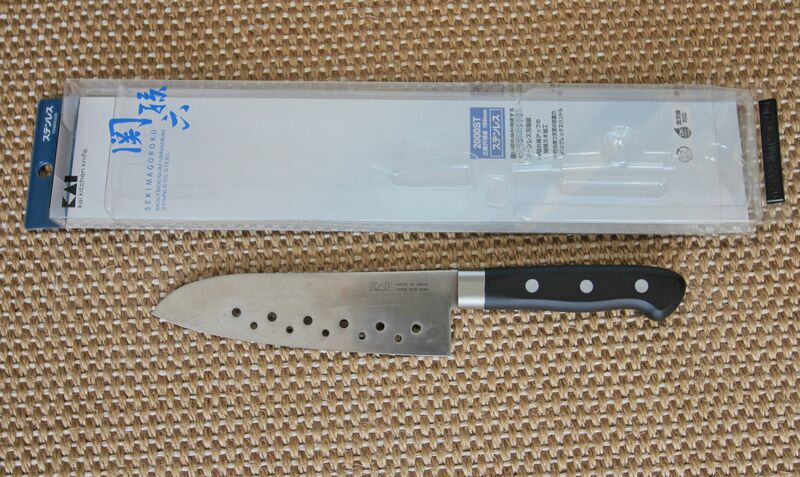 I bought this knife for $26 as an alternative to considerably more expensive Wüsthof Classic Chef’s Knife – 8″ – Vegetable or Gourmet Ridge “Vegetable Knife” 8″ . For all my skepticism about non-sticking properties of granton/ridged/perforated knives the KAI Seki Magoroku 2000ST AB-5251 Perforated Knife indeed performed well when slicing cheese or onion, at least for the first day of use while it was sharp out of the box. One day later the knife lost its edge, literally. 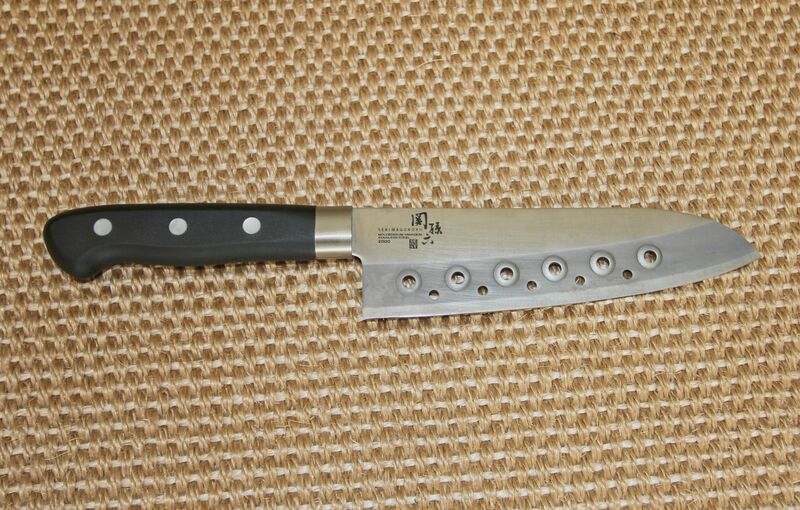 No amount of sharpening will fix it, the knife is made from low grade carbon steel – any contact with water kills the edge. Make no mistake, it’s a piece of junk. The KAI Seki Magoroku Perforated Knife feels flimsy (weighs about 110g) and cheap. The knife is very thin. The worst thing about it is oxidization – after three days of use the knife surface has darkened and small spots of rust appeared on borderline of non-stick strip and edge. What looks like a bolster is not a bolster but a thin metal rim. And it smells like cheap carbon steel though it’s supposedly made from molybdenum vanadium stainless steel. Sorry but the review isn’t very good imho. First you obvious used your dishwasher to clean the knife or you let it for hours in water. Never use a dishwasher for knives! I have 100%-non-stainless chromium free Shirogami-knives since years and they don’t look as bad as your knife after three days! You did something seriously wrong, so I guess you used a dishwasher! Even if you can’t see it with bare eye on other steels but simply avoid it, all steel knives losse loose sharpness, some faster, some slower. BTW. also Tojro VG10-Knives really hate long water contact on their cutting edges – they also tend to get spotting corrosion, but you usually won’t see it, as it’s only on the cutting edge, it’s only bad for the sharpness! 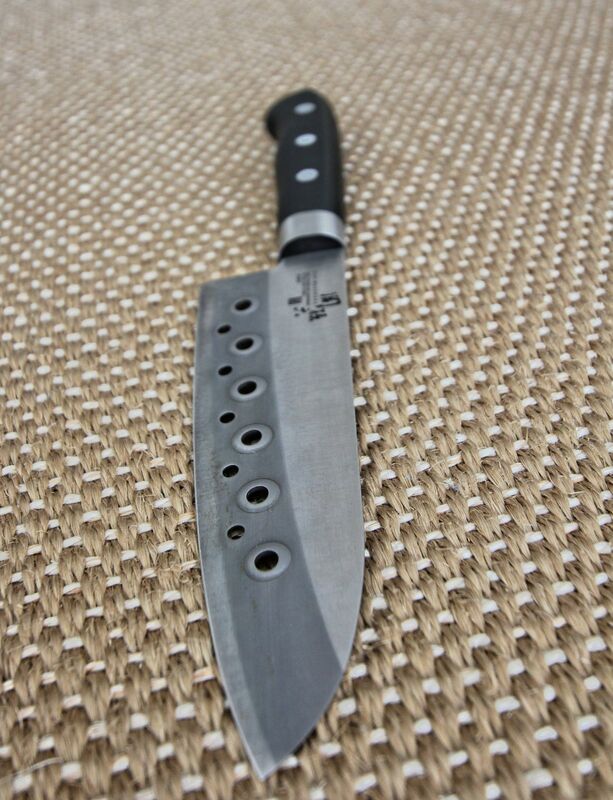 The steel, which is Daido 1K6 [email protected]°HRC (which is 100% exactly the same is also used for 3times more expensive Kai Wasabi knives), has only 13,5% Cr, similar to VG10, which makes it less resistant to rust than the 1.4116-Steel most German manufacturers like WMF, Wüsthof, Zwilling,… are using for their standard-lines, but it also offers higher hardness, toughness, edge retention and better sharpening than 1.4116 is able to offer. Also it sounds that for you that the knife is thin is a drawback – but many professionals and nerds are paying a lot extra to get an extra thin knife… that’s like having a racing bicycle and complaining about low weight and thickness. I think you didn’t see most the benefits of this knife at all! Thanks for your comment. I never use dishwasher for my knives. This specific knife had already rust spots under non-stick strip when the knife was delivered brand new. In about a week more rust appeared. I absolutely agree with you on benefits of thin knives and with everything you say but this particular knife is indeed a piece of junk. It has none of hardness and edge retention of other knives in my collection made from Aichi AUS-6M steel better known as Cromova 18 (global) or 440c or VG10.